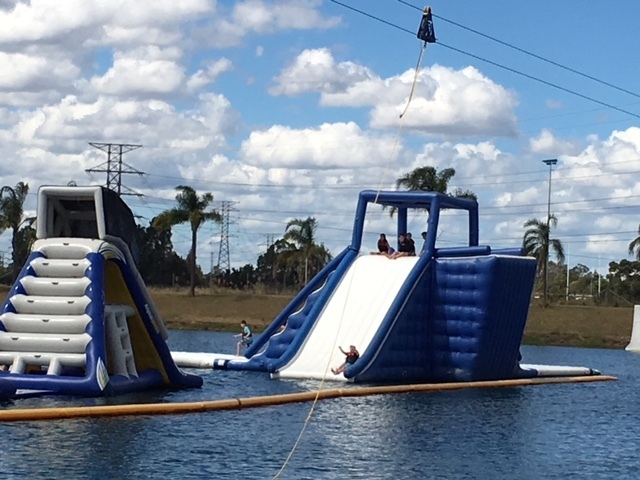 While there are still a couple of months left of Sydney's hot weather, a great way to cool off and have fun is an inflatables session at Cables Aqua Park. 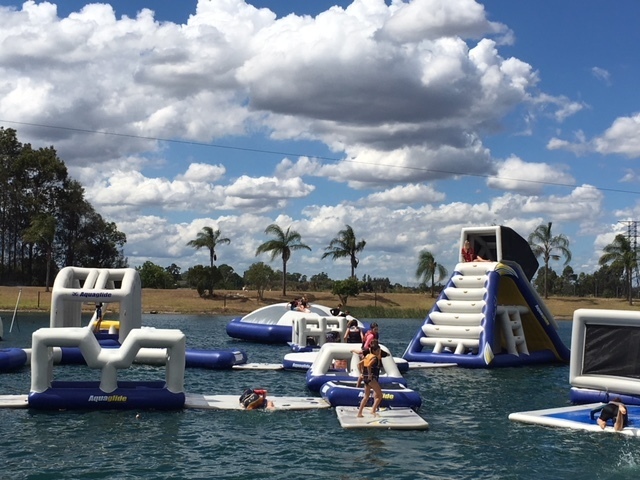 Consisting of a bunch of inflatable slides, jumping pillows, runways, volleyball court and climbing structures, kids, teens and big kids of all ages can enjoy clambering, climbing, sliding and bouncing about. It's actually quite strenuous stuff. The course is quite extensive and covers a good section of the lake. The water is fresh, so no chlorine or sore eyes to worry about and is mostly nice and clear. All the obstacles and structures are placed so participants can follow a route, or if they prefer they can just stay put and spend more time at one favourite structure. 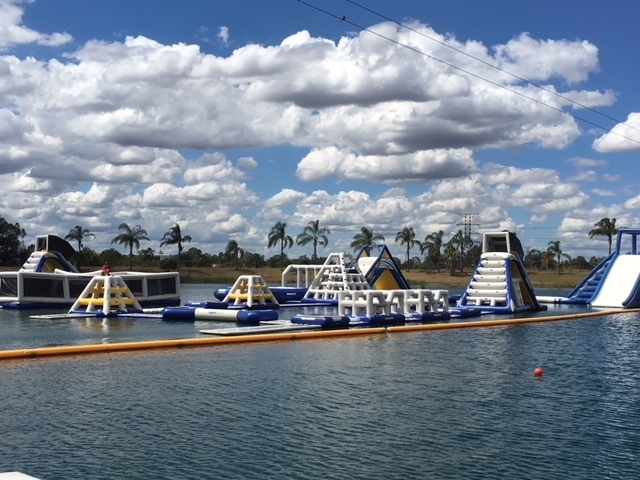 Participants must be at least 6 years of age and for the younger ones there is a designated area on the left where the inflatables are smaller in size, if the bigger ones seem a little daunting. 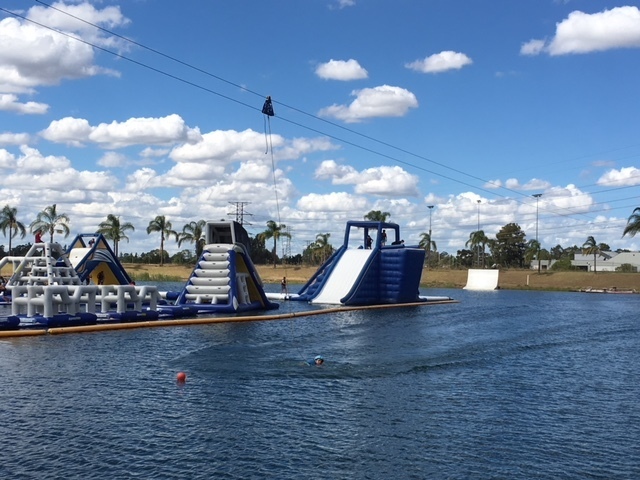 Sessions begin on the hour from 10am, with the last session of the day at 4pm, and run for 50 minutes which allows plenty of time to explore the entire course. Arrive a little earlier, fit your life jacket, listen to the safety brief and you are ready to go. Spotters/team members are dotted around the course keeping a close eye on things, so safety while participating is ensured for all. And when the siren sounds marking the end of the session, why stop at one? Go again or for all day fun purchase a day pass. The options are very flexible. Food is available on site with many choices for all tastes. Plenty of picnic tables are situated near the course and all under cover out of the direct sun. Situated just off the M4 at Penrith the park is easy to get to with ample free parking. So stay for a while and do a session or two or make a day of it. It's the quintessential summer activity.